Maya Alkhechen was born in Syria but went to school and grew up in Germany before returning “home” to a country she didn’t know. Seven months ago, she arrived back in Germany, after fleeing the Syrian civil war. Maya Alkhechen was born in Syria and came to Germany when she was six years old. 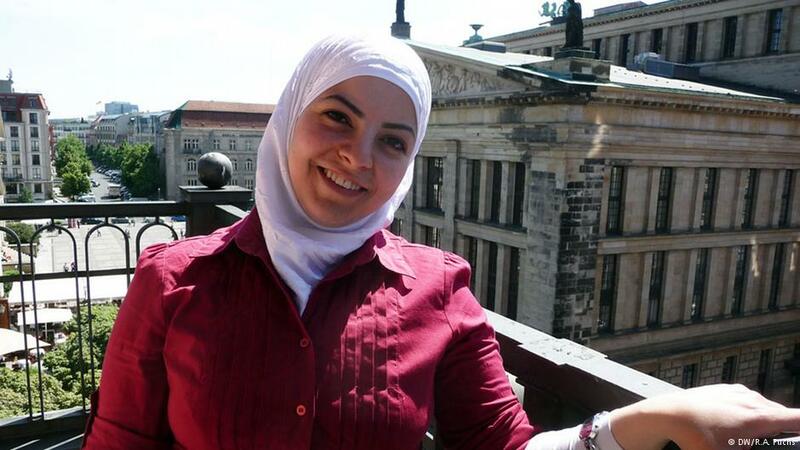 After finishing high school, she returned to Syria, only to flee from the civil war in 2013. She crossed Mediterranean Sea then traveled back to Germany. Deutsche Welle: Why did you return to Syria? Maya Alkhechen: I had graduated from high school in Germany and wanted to study medicine. I was already accepted, but then I was told that I couldn’t go. I needed a statement from the Foreign Registration Office because, at that time, my residence was only tolerated. The official told me I couldn’t go to university. I was 21 years old, what was I supposed to do, sit at home and twiddle my thumbs? I left Germany and went back “home” – to Syria, which I didn’t know at all. Did you study medicine in Syria? I applied to study medicine, but I wasn’t aware of the fact that I had to have my diploma verified. So I sent it back to Germany for verification. By the time I got it back, the university registration period had ended. Then I met my husband, we got married and I got pregnant. So I never went to university. Now I have two boys, aged six and three. When did you decide to leave Syria? I left after the civil war broke out. I lived right next to a barracks, so I saw quite a bit. My husband was detained several times. The second time he was jailed, there was a gunfight between the rebels and the soldiers in the barracks next door, and the bullets came flying into my apartment. At that point, I thought, this is it. We were lucky, my children and I were not injured. When my husband was released, he agreed that we had to do something. So we fled to Egypt. How did you get to Germany? The German government had a special admissions program for 10,000 Syrians – were you part of one of those special contingents? No. I was already here when the second group came. My brother did what he could so I could join the first quota, but failed because I was in Egypt and not in Lebanon, where the UHNCR [UN High Commissioner for Human Rights] registered refugees. Next, I tried to meet the German ambassador to Egypt in person, but I wasn’t admitted. I was told that I could only apply for asylum once I had reached Germany. I didn’t really want to enter the country illegally, but the journey across the Mediterranean was my only hope. I thought, if I arrive in one piece and healthy, my life will change. How long was the trip from Egypt to Germany? The boat trip was scheduled to take three days, but in the end, it took us seven days and six nights to reach Italy. Once we arrived, the coast guard detained us and took us to an emergency shelter. The next day, they opened the doors and told us we could go wherever we wanted. I didn’t hesitate to board buses and trains from Sicily to Essen. I have been granted asylum and I have a residency permit for three years. I still have a lot to take care of, but first I have to settle down. Thank goodness we now have our own apartment. My older son has epilepsy and is mentally disabled. We had to get a diagnosis to know what was wrong. We took care of that over the past months and now he is in line for various therapies. I had to register my husband for an integration course, and my children are in daycare. I volunteer at Pro Asyl, where I work as an interpreter, act as advisor and translate German correspondence. Is there anything you miss from Syria? Of course, we couldn’t take anything with us from Syria, nothing at all. In the boats, we were only allowed to bring a backpack. We decided to pack coats for the boys in my backpack because it tends to get very cold on the open sea, and two or three bottles of water. We put medicine for my son Hamza, a few apples and biscuits for the children into my husband’s backpack. So I left everything behind. Did you try tobring relatives over, too? Is that very difficult? I can’t bring my relatives to Germany because I would have to sign a formal obligation saying that I would pay all of their expenses: living expenses, food and everyday things they would need. Two of my sisters are still stuck in Libya, but I just can’t afford it. How do you see your future? Would you like to stay in Germany? Yes, I don’t want to go back. I hope to get a good job over the next three years, and I hope to transform by residence permit from three years to permanent. Then, of course, I’d like to apply for German citizenship.